Just wanted to create a reminder anyone in charge of the Twitch channel (I'm guessing Damiani or Kyle) that we have a Moobot is the chat and it's a shame it's not put to any use. It would be very convenient if the bot could have commands like !patreon or !youtube to link to those pages or like !toybox or !tabletop to give information on EZA shows. I believe @MichaelDamiani would be the guy for this. Yea we need to sit down soon and configure Moobot to do some basic stuff like this at the very least. If you have a list of suggestions you'd like to see implemented, post them here and we'll work on getting it setup. Things the commands could tell people about that I'd suggest, off the top of my head, are information about EZA, Patreon, individual shows and perhaps upcoming events (!eza or !tabletop). There should also be commands for the stuff that the mods now just copypaste every once in a while, like the Loot Crate stuff. Commands that are especially relevant could be posted somewhere really visible, like the stream title, with the rest at the bottom. It could also be used to automatically delete banned topics in the chat. Jokes aside, !patreon, !youtube, !eza ! *insertshownamehere should be a thing. It would also be kind of cool if the bot did a sub notification like SUB HYPE or something. OH, and there should be a !command to see a list of available commands. Honestly, a lot of these suggestions can be covered in the description panels. You're asking for a bot command to show Patreon, but all you have to do is scroll down for a Patreon link. All these things seem redundant. @Whoaness As you said, these are just suggestions. Not everyone uses a PC to watch the stream though so for people using the app to watch it could be helpful to have a chat command. If you have more useful ideas please share. @Olf_Himself Well if you use mobile, it's actually even easier to press the 'i' button for information than it is to type down an IRC command using a mobile's keyboard. The only people it benefits are people strictly using an IRC client and not even watching Twitch, and that's probably no one. Even Bosman knows that it can be disruptive and actually segments out a time in his Bos V Wos show for bets. You can't do this for everything. I mentioned the loyalty program though. It can be tricky. Mods and allies could figure out some sort of incentive, like mods giving out werehogs for people being helpful to other members, but this could be difficult to keep track of for mods. Maybe only give out points if the Ally says thanks to a specific person? Anyway, these two ideas require a specific Twitch bot to implement. It's not something Moobot can take on. And even though I'm putting these ideas out, I am against these ideas simply because it's unprofessional and it takes focus away from the stream content. Big streamers don't bother with these games or point program because they want to put on a professional show where they are the entertainment. Otherwise, keep the games available only when the stream is offline is another suggestion. @Whoaness Are you saying you don't want any commands at all? @Olf_Himself If advertising the website or shows are redundant, and games and loyalty programs are disruptive, then I don't see a point of adding commands. A lot of thought should be put into this decision, so the deliberation on it should be done by the Allies in their group meeting, however, I've shown I'm well researched in this subject, and I definitely don't see a point in doing it. @Whoaness It's about convenience. If we are talking about pure redundancy then even having information at the bottom of the screen or them talking about upcoming shows on stream is redundant since you can just go to the website for the information. I've seen plenty of professional streams use Moobots for promoting content or even just relaying twitter messages and such. My other concern is with spam. I personally wouldn't like to come to the channel and see people spamming the Patreon. As a general rule of thumb, the other mods and I will try to limit ourselves of one posting each of those sort of things so that it is seen, but so its not every other message. Opening up those shortcuts to the general populace, may create that issue. @Ruaidhri18 I'm pretty sure you can set it to whisper to the person issuing the command. 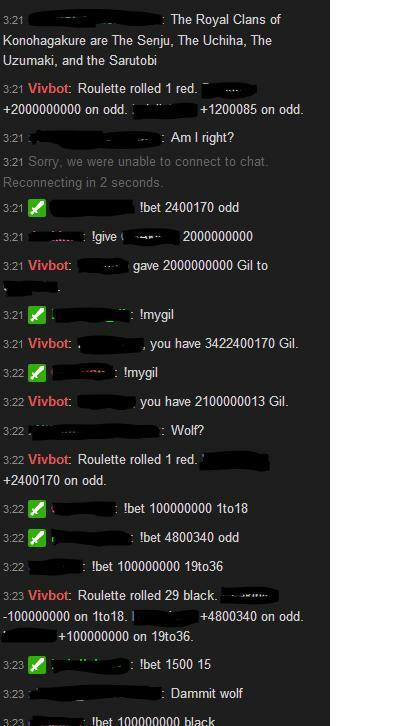 I've seen channels where only subs/mods can make a message visible in chat with a command. @Olf_Himself But you are suggesting something that is less convenient than scrolling down or pressing the information button on mobile. Upcoming shows? There's the schedule. Wanna know about Patreon? There's the button down there. Want to see EZA's youtube page? It's also down there. The only merit in one of your suggestions is description for shows, but that actually takes away from the show itself because the show hosts should be and are describing the shows themselves. You might as well be linking them the show, but if you directly link one episode, not only does someone need to update it every time, it also takes away visits from the EZA Youtube home page which advertises multiple shows. Maybe that's what they want. Maybe it isn't. I certainly wouldn't want to direct flow from home page which I set up to maximize content advertisement. And about your reply to Ruaidhri, the person issuing the command is going to be seen, and that could be disruptive. @Whoaness How does a command like !tabletop which gives the user a description like "Tabletop Escapades is a show where the allies play DnD with the 5E ruleset in world created by Ben Moore" take away visits to the youtube or homepage? If anything it would direct more traffic there. Also, in regards to the command itself being disruptive, I have to disagree. Plenty of channels with 10 times the amount of viewers we get on a regular basis have similar chat commands and have no problem with them taking over. I don't think people would get triggered by a new person once in a while using !easyupdate to find out what it is if they hear them talking about it on the stream. But I only made this thread to remind them that we had a bot at all and if the only thing they use if for is automatically removing banned text that's fine by me. @Olf_Himself Because someone could look at the text and say "Oh that sounds stupid" and not even look at the video, whereas if the viewer watches the video and see Ben talk about it, Ben would describe it more accurately and with a much more convincing voice than text, and the viewer might be inclined to keep watching since they already opened it up. @Whoaness Are you sure someone who would be completely turned off by a a short sentence could even be bothered to sit through an hour of content?